Then, they just plug in a meal for each day. Maybe one Monday they will have fajitas, the next Monday they will have tacos, the next quesadillas. Whatever they eat on Monday is some type of Mexican food. With this method, you look at your upcoming monthly calendar and plan meals accordingly. For instance, in my case, my son has tap dance class every Wednesday night. I know on these nights not to plan anything time intensive. On Wednesdays, I either choose crock pot meals that allow me to do the prep work in the morning and then require no additional work from me, or I schedule that day as a day to eat leftovers. Similarly, if you look at the calendar and see that you are taking Uncle Joe out to eat on the 20th and you know he will want to go to a steak house, you probably won’t schedule another beef meal on the 19th or 21st. This method works great for people who generally dislike menu planning and prefer to get a month’s worth of planning done in one setting. 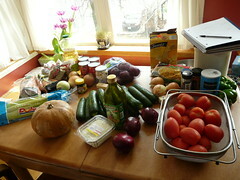 Probably the most common method of menu planning is to center your meals around what is on sale at the grocery store. So, you get your supermarket ads on Sunday and see that ground beef is on sale as well as whole wheat pasta. Salmon is also on sale. Maybe you choose to make spaghetti (spaghetti sauce recipe) on Tuesday night, lasagna on Wednesday night and a salmon salad for Friday night, for example. If you don’t regularly stock up on groceries when they hit rock bottom prices, this is the method of menu planning that will net you the largest savings. This is the method that I prefer because I regularly stock up on groceries when they are at rock bottom prices. Before I make my menu plan for the week, I look at what ingredients I have at home and make a menu centered around those items. Recently I bought Tilapia on sale, so we will be having a fish meal this week. I also bought imitation crab meat on sale two weeks ago (prepackaged), so I will be making crab cakes. However, I don’t want all of my meals for the week to be seafood based. I see that chicken is on sale for $1.49 a pound, so I plan two chicken meals and also buy some extra chicken to stock up in the freezer. I also have tomatoes and avocado that need to be used up, so I plan on having taco salad another day. The most important part of menu planning is choosing the method that works best for you and your family because then you will be most likely to stick with it. In addition, remember to be flexible with yourself. If you have a meal planned on Monday that you don’t feel like cooking Monday night, it is okay to jump to Wednesday night’s meal. It really doesn’t matter which day you prepare which meal as long as you prepare all of the meals within a week’s time so you don’t waste ingredients. Finally, if you are ready to take the leap to menu planning, one of my favorite free online resources is food.com. You can easily search for the type of meal that you would like to make and find hundreds of recipes, many of which have been ranked by other users. I tend to only use recipes that earn 4.5 to 5 stars out of 5. You may feel as if you don’t have time to meal plan, but often menu planning saves an enormous amount of time. If you don’t do it already, I hope you will try it. Does this sound familiar? It is 5 p.m., and you stop by the grocery store after work. You don’t have much time to make dinner before you have to go to a parent/teacher conference at 7 p.m., so you buy some carrot sticks, a pound of meat, whole wheat buns and sloppy joe mix from a package. Oh, don’t forget a bag of chips. That covers dinner for tonight. The next night, it is the same story, but this time you have had a really stressful day at work and all you want to do is go home and relax, so you go through the drive through and spend $25 to feed your family of four. 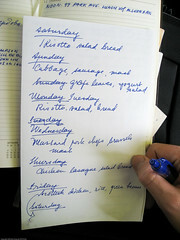 If this sounds familiar and you want to save yourself some time and money, try menu planning. Life is busy whether you are a stay at home parent or employed full time, whether you have kids or not. A menu plan is the best way to help control the chaos that surrounds dinner time. If you go to the grocery store with a list of all the necessary ingredients needed to make your meals for the week, you will be focused. You should be out of the grocery store in 60 minutes or less. If you operate without a menu plan, it is not unusual to stop by the grocery store (or to go through the drive thru) four to five times a week. If your average stop is about 20 to 30 minutes, you are spending 80 to 150 minutes a week. Having a grocery list and shopping only once a week will save you 20 to 90 minutes a week! Unless you are extremely disciplined, you make impulse buys when grocery shopping. Let’s say you make three impulse buys each time you shop. If you only enter the grocery store once a week, you are only making 3 impulse buys. If you grocery shop 5 times a week, you will likely make 15 impulse buys. Depending on the price of the unplanned items, you could be spending as much as $15 to $30 and upwards a month by shopping so frequently. If you make a menu plan and a grocery list, you give yourself time to look through the ads and choose recipes that take advantage of sale items, lowering your grocery bill overall. By contrast, if you stop by the store every night and buy what you “feel” like eating that night or what is convenient to make, you will be spending much more weekly. Even though it may not be something you do now, hopefully realizing the time and financial payoffs will have you thinking about menu planning. Next time we will explore the mechanics of menu planning.